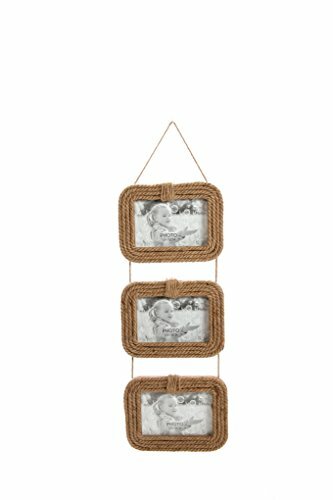 Hosley's Jute Rope Three 4" x 6" Photo Frames - 20" High. Ideal Gift for Wedding or Special Occasion and use for Party, Home / Office, Spa, Bathroom Setting. USES: This decor is perfect for adding a decorative touch to any room's decor. Perfect for everyday use, wedding, events, aromatherapy,Spa, Reiki, Meditation, Bathroom setting. Pair this with your existing decor, or with a multitude of our wall decors to create an interesting and unique accent wall in your home! BENEFITS: They feature a contemporary style, giving it a sleek design. This charming wall decor will add a touch of warmth to any décor.